In an ever-growing city like Atlanta, traffic congestion is always a major challenge – one that impacts both economic growth and quality of life. The Northwest Corridor (NWC) project and its Express Lanes are a critical component of a strategic transportation plan to provide options for more reliable travel times on one of the region’s busiest thoroughfares, the I-75 corridor in Cobb County. 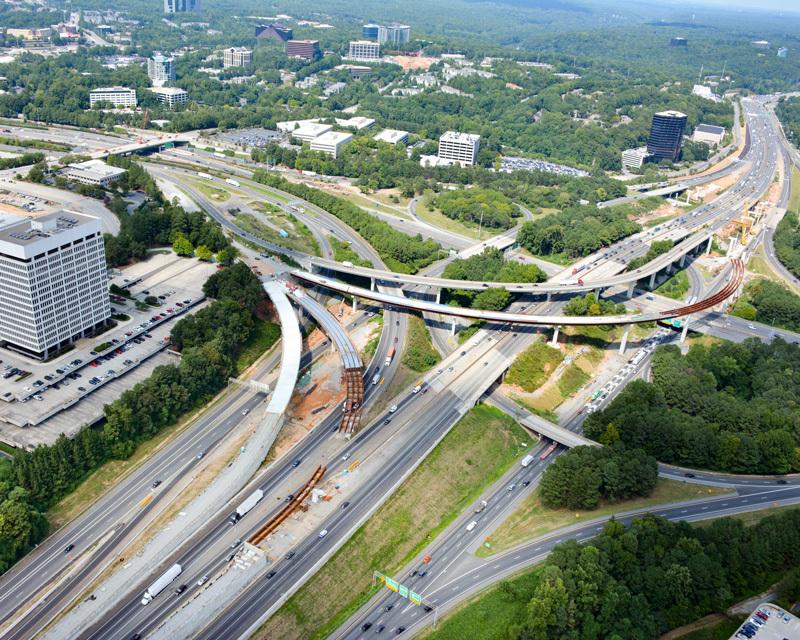 To put it into perspective, the I-75 and I-285 interchange has an average traffic rate of more than 450,000 vehicles per day – that’s more than 164 million vehicles passing through each year. The Northwest Corridor Express Lanes will be a part of the Georgia Express Lanes System, a growing network of new toll lanes that are being constructed along existing interstates throughout Atlanta. Express lanes are being recognized as an innovative way to address congestion, add capacity and support transit. With the success of the I-85 Georgia Express Lanes and other similar systems across the country, Express Lanes have proved to be a cost-effective way of providing commuters with much-needed travel alternatives along high traffic volume corridors. Motorists have the choice to pay the toll and use the Express Lanes when they need to, while the general purpose lanes remain open to travel without a toll. The demand-based pricing of the tolls helps to ensure that the Express Lanes offer a more predictable commute time. Tolling also offsets construction, maintenance and operation costs. Two years into the project with nearly two more to go, project contractor – Northwest Express Roadbuilders (NWER) – hopes to shrink the footprint of the project in terms of traffic impacts as much as possible by the end of 2016. This will include satisfying the majority of requirements north of I-75 along I-575 and thus alleviating the vast majority of traffic impacts in the northern portion of the project. However, work will still continue in the same fashion south of the I-75/I-575 split – comprising bridge foundation, bridge substructure and superstructure, retaining walls, earthwork, asphalt and concrete paving, sound wall construction, lighting installation, tolling point foundation and tolling point gantry work. NWER plans to accomplish the majority of work for the entire project by the end of 2017. Until that time comes, commuters can expect continued lane closures and intermittent detours, as needed. The NWC project team strives to work during off-peak hours with minimal impact to the traveling public, and GDOT provides notice to the public when there are higher impact construction activities such as detours, traffic paces and multiple lane closures. A weekly update is emailed to subscribers regarding upcoming traffic impacts, as well as a quarterly newsletter update which provides notable project highlights and project milestones. To sign-up to receive these email updates and traffic alerts, visit the dedicated page at www.dot.ga.gov/DS/GEL/NWC. As reversible managed lanes are a new concept to Georgia drivers, a dedicated effort has been made to educate the public on the project by defining the managed lanes and detailing the location of access points for the managed lanes. GDOT is also partnering with the State Road and Tollway Authority to educate the public about PEACH passes, which are required to access the system. The Northwest Corridor Express Lanes project will add 29.7 miles of reversible toll lanes along I-75 from Akers Mill Road to Hickory Grove Road and along I-575 from I-75 to Sixes Road. 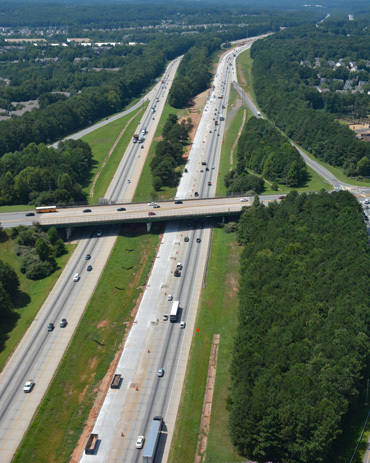 Two new lanes will be built to the west of the existing lanes along I-75 from I-285 to I-575. From that interchange, one new express lane will be added along I-75 north to Hickory Grove Road and one new express lane will be added along I-575 from I-75 to Sixes Road. The lanes will be managed by dynamic priced tolling – allowing drivers to choose to pay a toll to bypass congestion, and will operate southbound in the morning and reverse to northbound operation in the evening. $834 million, including $536 million in public funding by the State of Georgia for capital costs.